Indiana University alumna Emily Webber is visiting IU Bloomington as the Class of 1963 Wells Scholars Program Professor through Feb. 15. Webber is Chief Medical Informatics Officer for Riley Children’s Health, Indiana’s largest and most prestigious pediatric system. She is also associate CMIO for Indiana University Health, the largest network of physicians in Indiana, including 15 hospitals and dozens of outpatient locations. 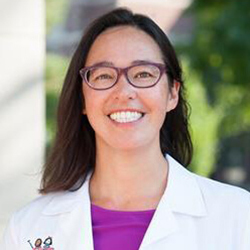 A practicing physician, board certified in pediatrics and clinical informatics, Webber is also associate professor of clinical pediatrics at the IU School of Medicine. As the Wells Scholars Program professor, Webber will lead an honors interdisciplinary colloquium for undergraduate students titled “Digital Natives: How Patients, Clinicians, and Health Systems Use Technology” in partnership with Professor Kay Connelly, associate dean for research in the School of Informatics, Computing, and Engineering. While on campus, Webber will also engage with students in the Health Professions and Prelaw Center and the Board of Aeons, a group of which she was a member during her undergraduate years at IU. She will also attend a faculty lunch and coffee hour and speak at an evening reception. “We are deeply grateful to Dr. Webber for taking time out of her busy life to make herself available to our scholars and the campus community,” said Christoph Irmscher, director of the Wells Scholars Program and Provost Professor of English. “She joins an illustrious group of Wells Scholars Program alumni who have returned to teach classes for us.” Past Wells Scholars Program Professors include Douglas Kysar, Deputy Dean and Joseph M. Field ’55 Professor of Law at Yale University; Marion Werkheiser, founding partner and chief executive of Cultural Heritage Partners in Washington, D.C.; and Noah Bendix-Balgley, first concertmaster of the Berlin Philharmonic. The Wells Scholars Program Professorship is supported by donations made by alumni during the endowment campaign for the Wells Scholarship. Its purpose is to bring outstanding researchers and artists to campus. Previous Wells Scholars Program professors include South African civil rights activist Helen Suzman, playwright Athol Fugard, novelist and critic Sir Malcolm Bradbury, anthropologist Clifford Geertz, security expert Sir Timothy Garden, geologist Walter Alvarez, and the Wells Scholars Program alumnus Douglas Kysar of Yale University. Named in honor of Herman B Wells, IU's beloved 11th president, the Wells Scholars Program pays the full cost of attendance for four years of undergraduate study on IU's Bloomington campus. The program invites an accomplished alumnus each spring to teach as a Wells Scholars Program professor, providing extended opportunities for current students to study in a small-class setting and interact with these professionals through special programs and events. The Wells Scholars Program Professorship is supported by donations made by alumni during the endowment campaign for the Wells Scholars Program.